In a fickle world that sometimes takes people too quickly, “only the strong survive.” Those words from Jerry “The Iceman” Butler, five-time Cook County Commissioner and perennial soul man, provide the basis for a song, an autobiography, and now this documentary about the living legends of soul music. Where are they now? Still groovin’. Only the Strong Survive is a unique documentary that follows the continuing musical pursuits of soul music’s earliest stars, including Isaac Hayes, Sam Moore, and Wilson Pickett. Rather than dwelling too much on the past, the focus is on contemporary happenings and what these artists were up to at the time of the movie’s production. The documentary follows a format similar to that of another Miramax production, Calle 54, which focused on the living legends of Latin music. Only the Strong Survive, though, has the upper hand in terms of real-life people that also serve as engaging characters with strong, lively personalities. Also unlike Calle 54, there is more fluidity as segments are interwoven from artist to artist. Interspersed with the requisite interviews and introspections are fantastic live performances from the aforementioned, plus Butler, Ann Peebles, Mary Wilson, The Chi-Lites, and others. Also adding to the mix are inspired bits of comedy from another soul legend, Rufus Thomas, and Jaye Davis, who co-hosted a radio show on WDIA out of Memphis, Tennessee. One of the remarkable things to notice is how well these legends have all aged, and how well they still hold up on stage. Pickett, in particular, proves he is still The Man and he has no need to slow his Mustang down. Sam Moore also still has his mojo going as he belts out tunes, particularly the (yes) soulful “When Something is Wrong with My Baby,” with the same sincerity and power as if they were being performed for the first time. In fact, this troop of some of soul’s best and brightest seem to have aged far better than their audiences, who, as captured in the film’s live performance scenes, at times prefer to sit even when encouraged to stand up and get in the groove. 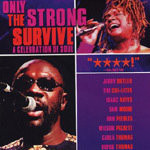 Whether it’s Butler’s stately demeanor and uplifting delivery of “Only the Strong Survive” or the quiet perseverance of Isaac Hayes, seeing these stars still at the top of their game is inspiring and provides a hint at what might be the secret to this club’s graceful aging: The feel-good power of laughter and soul music. This DVD edition is one of those rarities in which the supplemental features truly add to the movie-viewing experience with worthwhile features that tell more of the story. Included are six additional live performances. They are all outstanding, but Ann Peebles’ sterling rendition of “I Can’t Stand the Rain” and Sir Mack Rice explaining the origins of “Mustang Sally” are tops. Adding depth to some of the history of soul is an informative running commentary by Jerry Wexler, Carla Thomas, Marvell Thomas, Sam and Joyce Moore, and producer Roger Friedman. Also on board are additional comedy segments from The Rufus and Jaye Show. There’s also a nice featurette entitled What is Soul?, with answers from Sam Moore, Wilson Pickett, Mary Wilson, and Carla Thomas. Rounding out the package, the DVD includes biographies and discographies for the featured artists — a feature that has been used as mere padding on other DVDs, this time it’s worth a peek. While not an exhaustive discography of all the artists’ releases, the feature includes some nice bits of trivia, including the fact that Sam Moore fired Jimi Hendrix from his band in 1965. The film is presented with a sharp full screen picture and crisp Dolby Digital 5.1 and DTS 5.1 Surround Sound. Also available are Spanish subtitles as well as English captions.